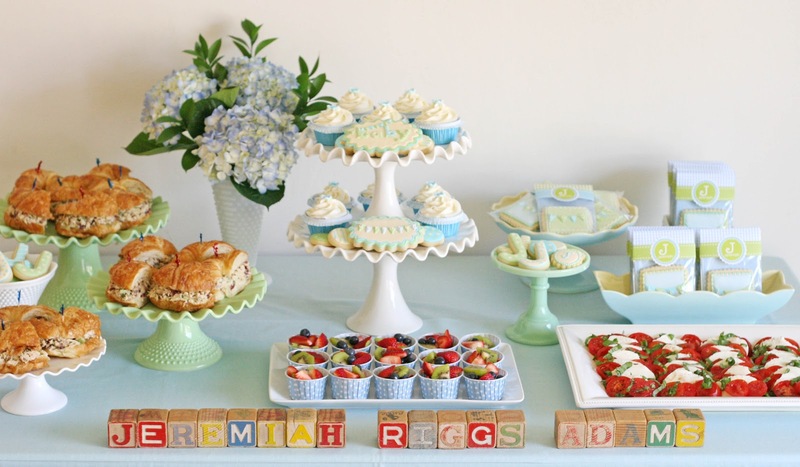 I recently had the honor of hosting a baby shower for my little sister, Joy (don’t be confused… if you’re a long time follower, you may realize that my youngest daughter has the same name). We knew that the baby-to-be would be a boy, with the name Jeremiah already decided (to honor a recently deceased very special Grandpa). I also knew that baby Jeremiah’s room was painted a beautiful, soft blue. Along with Joy’s leading, I chose a color palate of mixed blues, along with touches of green to pull the party elements together without the typical “themed” feel. I created a fabric bunting using fabrics in various colors, both solid colored and polka-dot to add a bit of a vintage feel. 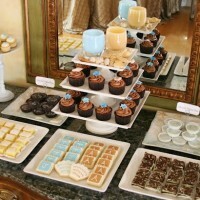 The bunting was an element that I included in the invitations and the cookie favors as well (as you’ll see below). One of my very favorite elements of the food table was the antique blocks shared by a long time family friend (Sally), that were used to spell out sweet Jeremiah’s name. We also used more of these antique toy blocks on the little side tables and drink tables outside (where most of the party took place). Fresh fruit served in individual treat cups (these are from Shop Sweet Lulu). 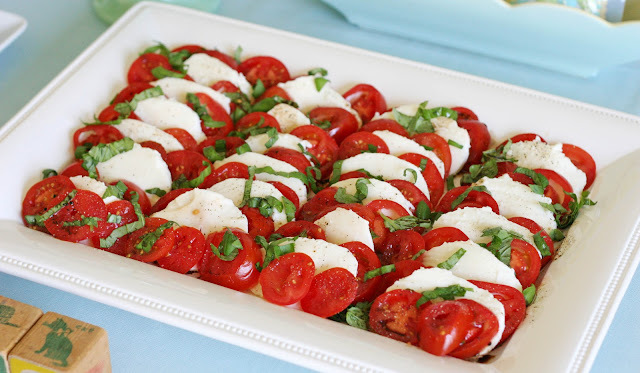 Delicious Caprese Salad, one of my favorites! 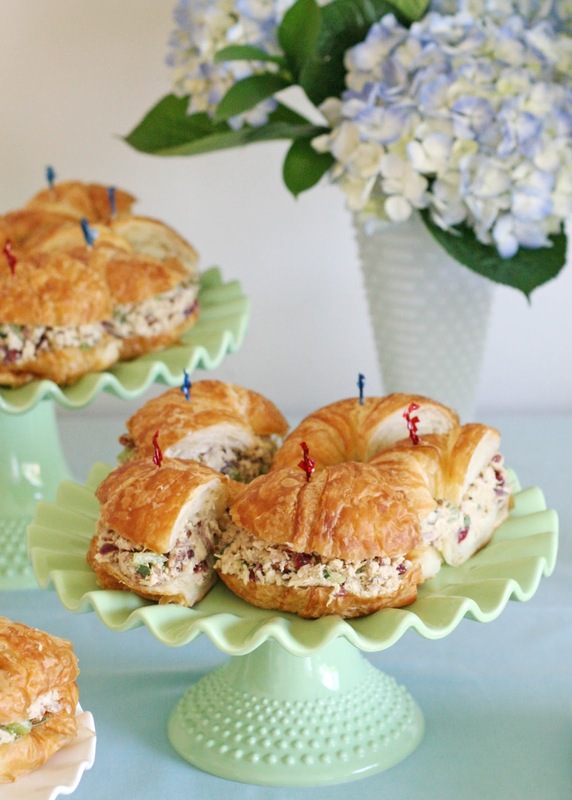 I often make these Chicken Salad Sandwiches for parties. 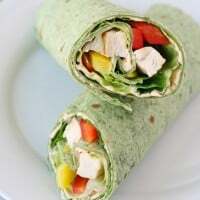 The chicken salad can be made a day or two in advance, and they are always enjoyed! For the sweets, I made Chocolate Cupcakes with Vanilla Cream Cheese Frosting, and topped them with simple, pre-made flowers (from Sweet Estelle’s Baking Supply). 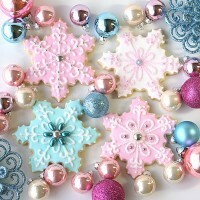 I also made decorated Sugar Cookies, some to be enjoyed at the party, and others wrapped as favors. The favors were a single, special sugar cookie, decorated with a little bunting design (I’ve posted the bunting cookies tutorial HERE). I packaged the cookies as I’ve show HERE. The personalized labels and the finishing paper trim on the packages were from Paper Jacks. 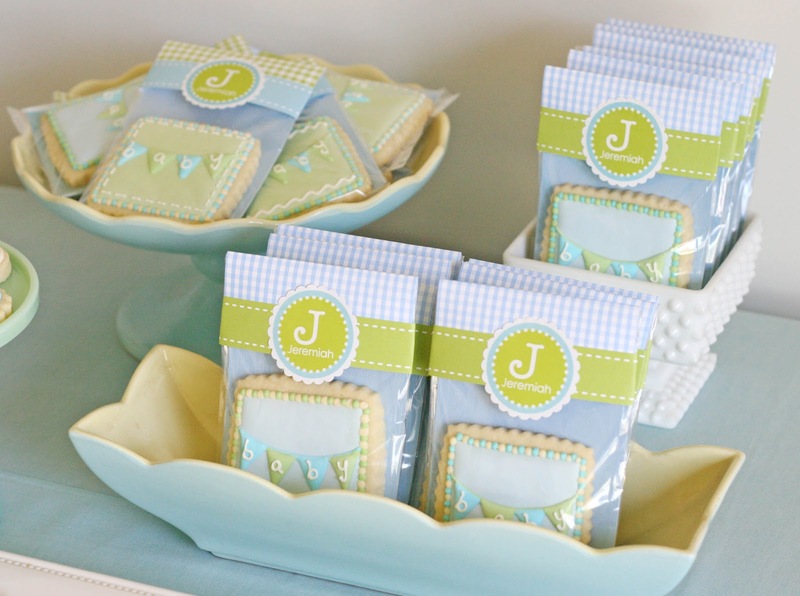 I displayed the cookies in vintage milk glass, and Hull Pottery. 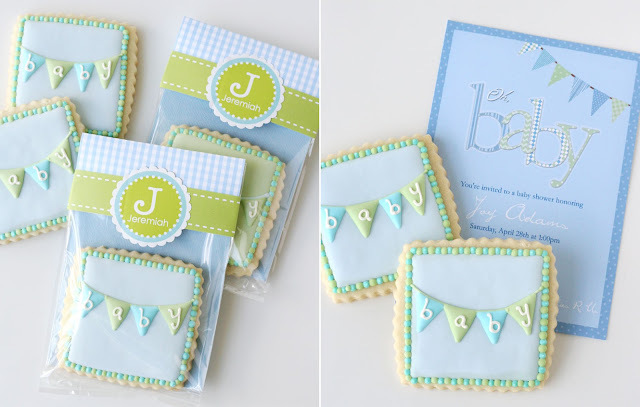 Here’s another look at the favor cookies, which were inspired by the custom invitations by Swish Designs, and then packaged with perfect labels and paper ribbon from Paper Jacks. Donna of Swish Designs did a great job creating a special invitation to incorporate the look of the fabric bunting. 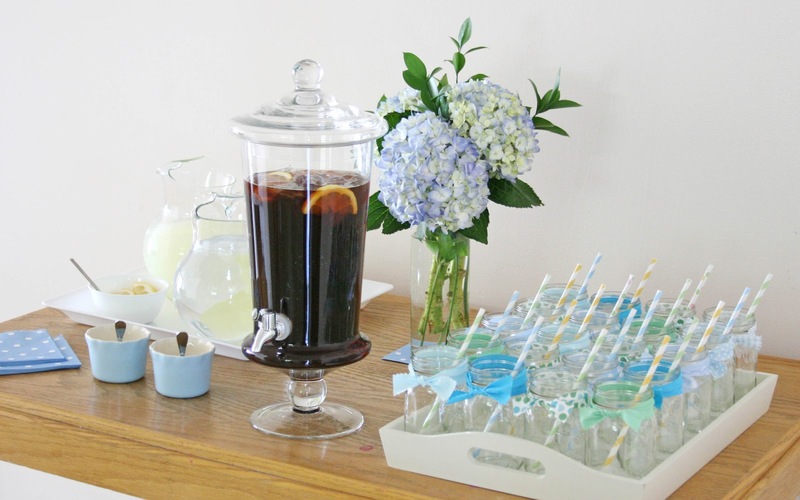 In the kitchen, I had a table for drinks (iced tea, lemonade and water). I used extra fabric from the bunting I’d made to tie around mason jars, to be used as drinking jars. I carefully calculated the number of different fabrics I had, and then used 4 different colors of straws (from Shop Sweet Lulu) and was able to have each jar have a different combo of fabric and straw color, thus identifying each glass (without name tags). 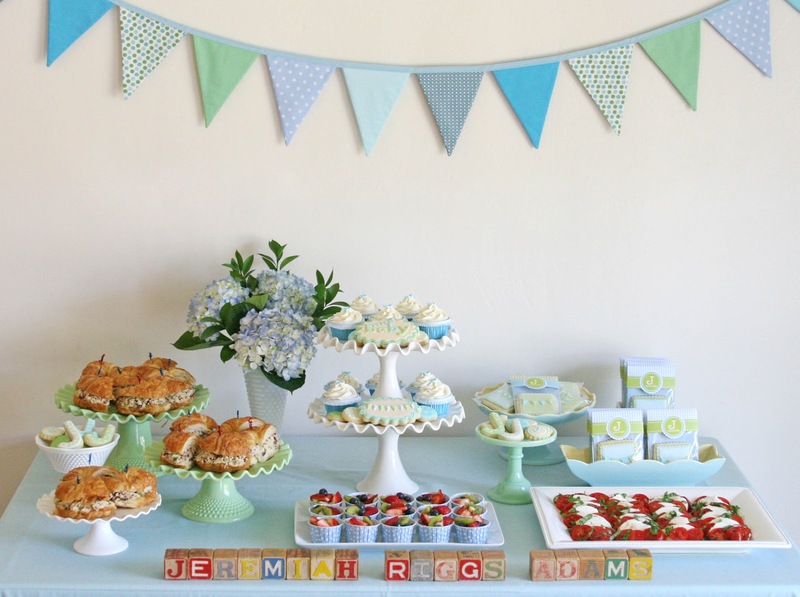 Although baby Jeremiah was due to arrive a month after the shower… apparently he’d heard about “Glorious Treats” parties and didn’t want to miss it! He arrived quite early (at 32 weeks) but was surprising healthy (thank you Jesus!) 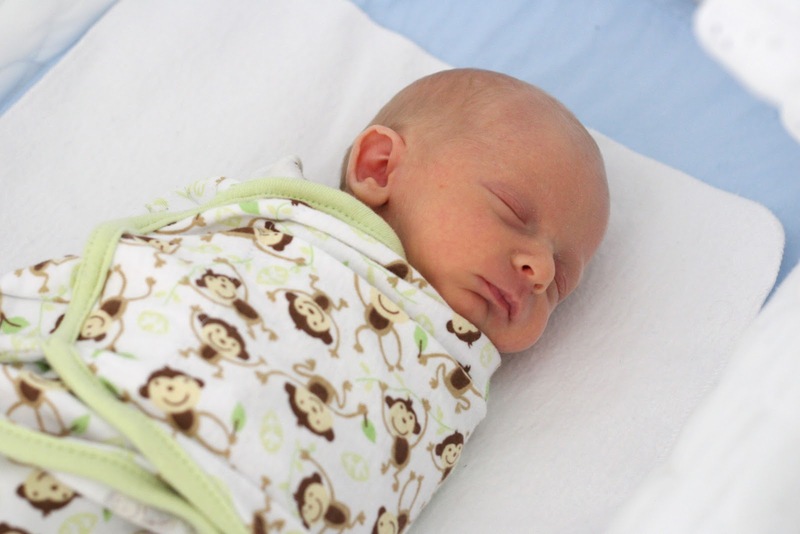 and was able to come home less than 3 weeks after delivery, and made it to his own shower! 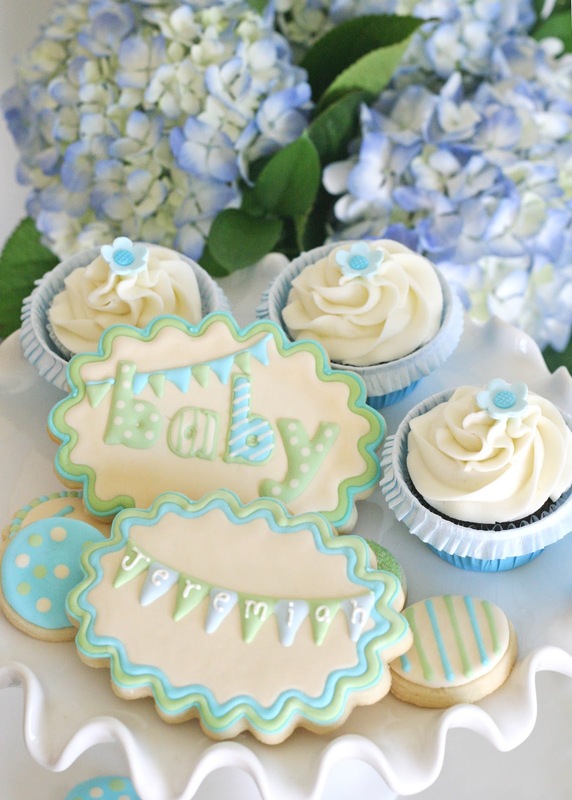 All styling and photography by (me) Glorious Treats. Recipes linked below (or near) the appropriate item within the post. Invitations by Swish Designs *Use the code GLORIOUS at checkout with any Swish Designs order on Etsy for a 10% discount. Polka-dot treat cups and paper drinking straws from Shop Sweet Lulu. Cookie favor labels and paper ribbon from Paper Jacks. Hi there, I’m looking for your vanilla cream cheese frosting recipe on your site, but every time I click on the link to retrieve it, it comes back to your home page. 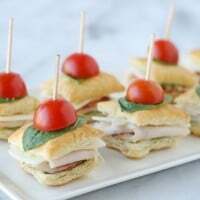 Would I be able to get a copy of this recipe sent to my email please? Thanks so much, I absolutely love your site! Great ideas here! Beautifully styled as always. I really love the way you packaged the cookies. It looks so professional with the colored paper in the back. Genius. 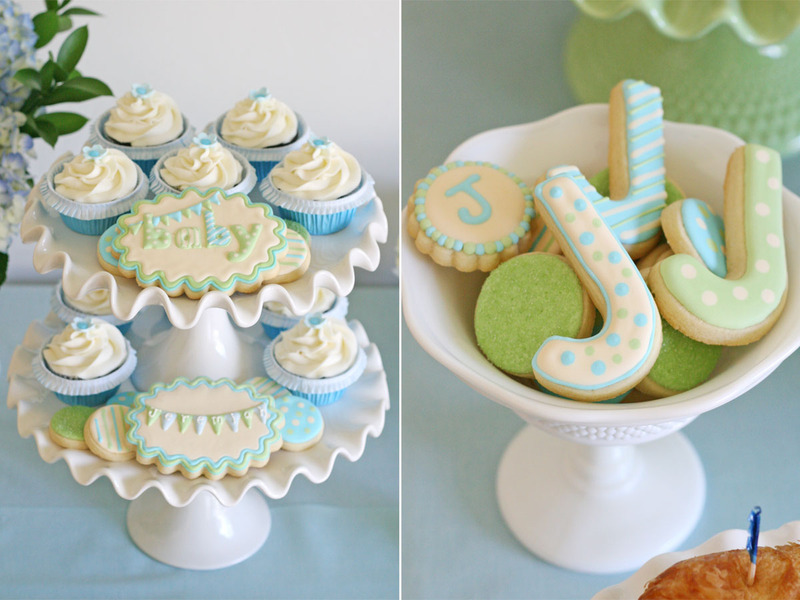 The gorgeous blue bowl that you have the sugar cookies in, do you mind sharing where you got those? Thanks! Hi Esther, Thanks! The blue pottery is vintage pottery from a company called Hull. If you look on e-bay for “hull pottery” you will find a lot. You will likely have to look though a lot of listings to find some similar pieces, but they can be found from time to time. Happy hunting! 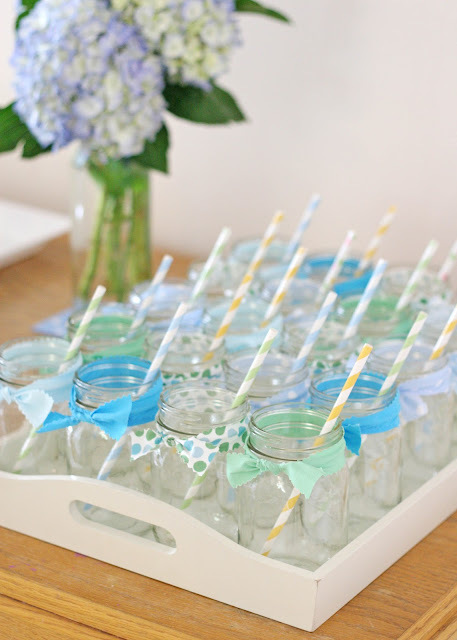 Where did you find the ribbon for the mason jars? 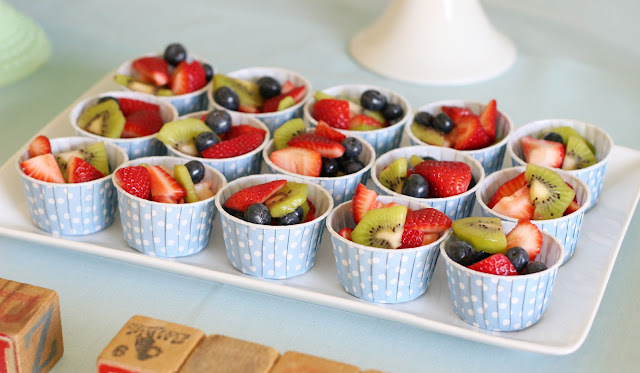 What size are the mason jars and the tray that you used to it? Did you use Costco size croissants when you made the chicken salad sandwiches? If so, did you cut them in thirds? Also, how many whole sandwiches (before cutting) does your recipe fill? Yes, I used (and love) Costco croissants. These are just cut in half. I’m not exactly sure how many sandwiches one batch of the chicken salad recipe will fill, but I’d guess about 10 full sandwiches (20 halves).